Jitu Rai missed the final by one point in the Men’s 50m Pistol at the ISSF World Cup in Gabala, Azerbaijan. The army shooter who had won a gold at the World Cup in New Delhi earlier this year, shot 558 (96,96,92,93,93,88) to finish 12th in a field of 55 shooters. It was an improvement for Jitu after he had shot his lowest ever World Cup score of 551 last month in Munich. Amanpreet Singh who had won a silver behind Jitu at the World Cup in New Delhi shot 556 (94,94,93,91,93,91) to finish 15th. Like Jitu, Amanpreet also improved his score of 537 that had seen him place 60th in Munich. The third Indian in the fray, Olympian Prakash Nanjappa shot 549 (92,90,88,94,92,93) to finish 26th. Prakash had shot the same score in Munich. The gold in the event was won by Ukraine’s 33-year-old Oleh Omelchuk, pocketing his fifth World Cup gold in this event. 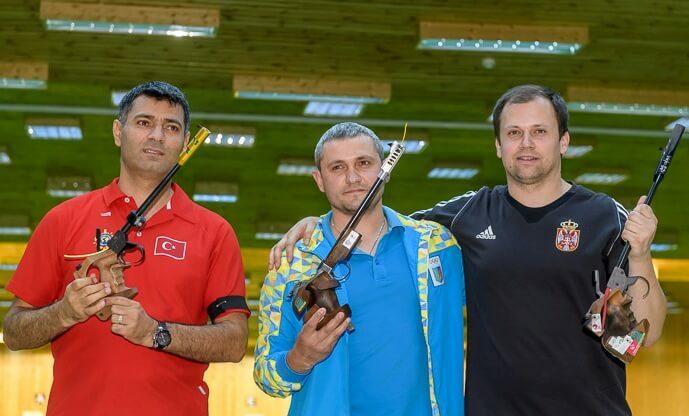 Yusuf Dikec of Turkey won the silver while Serbia’s Damir Mikec won the bronze. Men’s 50m Pistol: 1. Oleh Omelchuk (Ukr) 230.4 (568); 2. Yusuf Dikec (Tur) 228.5 (563); 3. Damir Mikec (Srb) 205.5 (559); 12. Jitu Rai (558); 15. Amanpreet Singh (556); 26. Prakash Nanjappa (549).